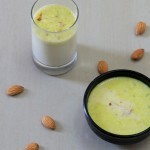 Badam milk recipe is a favorite chilled drink recipe mainly amongst the kids. Almond milk is the most nutritious and a very rich drink best when served chilled. We usually buy various flavored drinks of almonds, pistachios and this is better than what we get at the stores. Its very thick, nutritious, healthy and rich. 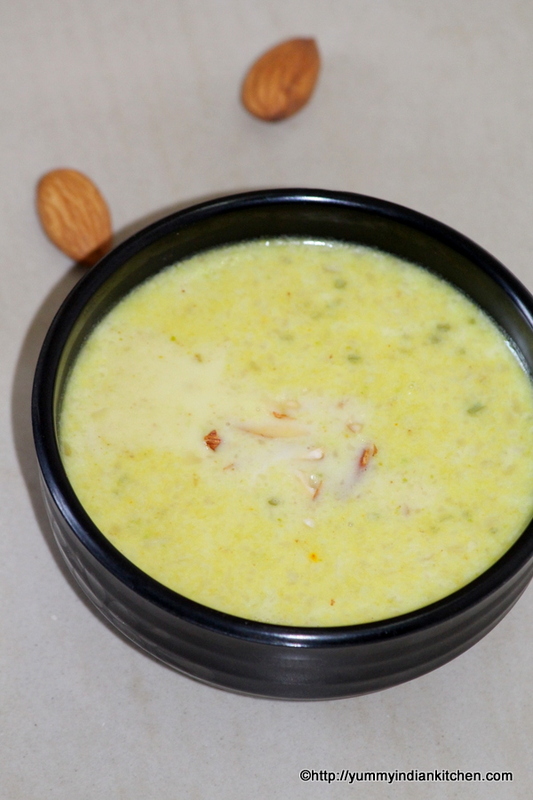 Here, in this badam milk we need to make a powder and also I have used badam paste to thicken the milk and into it the badam powder is added to give the best flavor of kesar. This is the best chilled drink I have tasted so far and a wonderful and healthy drink to be taken during summers. I have decided to post various summer recipes to keep us cool and something that would refresh us as soon as we drink it. Badam milk making technique is the secret behind making such a delicious drink and this recipe is not only good for summer but can be given to kids as a healthy drink and can be taken during any season. Badam is the hindi term for almonds and we all know that almond has got all the health benefits and is a great energy booster drink. 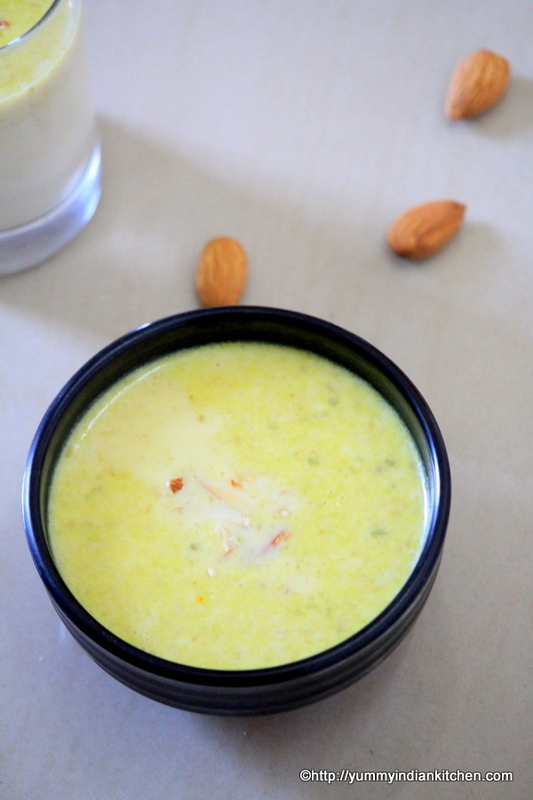 Kesar badam milk tastes best if we use a double toned milk or a whole milk and I can assure that this taste is better than the store bought one. 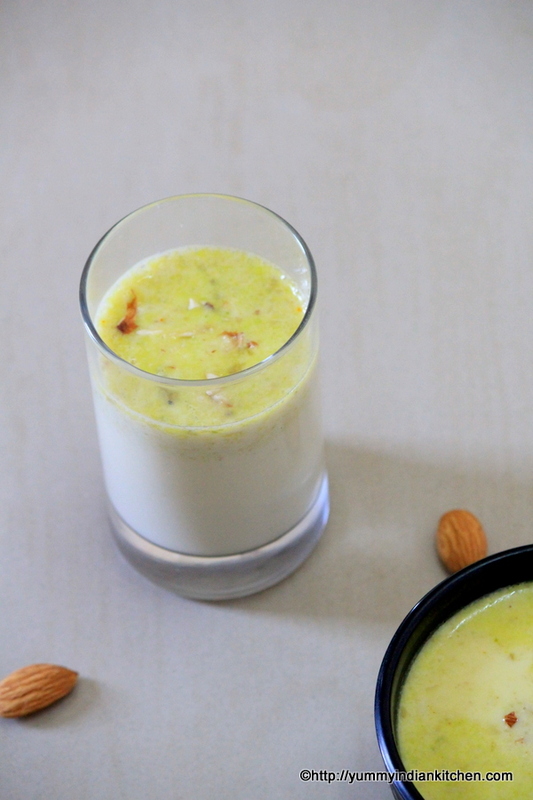 A summer drink recipe made with badam powder and milk and served chilled. 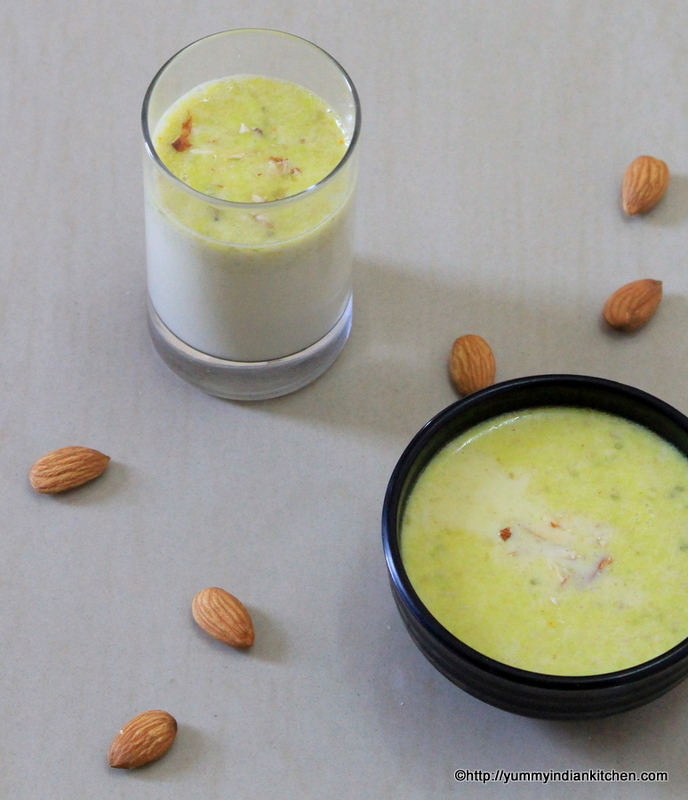 In a blender, add almonds, cashews, pistachios, cardamoms, saffron strands, sugar. Blend this mixture into a fine powder. Rest it aside for further use. Firstly in a non stick pan, add milk and bring it to a boil. Into it add the almond paste, mix and cook for 5-10 minutes on low flame and keep stirring while cooking. Into it add the blended badam powder. Stir and cook the mixture for another 5-10 minutes on low flame. Chill the badam milk in the refrigerator for an hour or two. Once it gets chilled pour the milk into the glasses. This sounds absolutely delicious! I love the addition of cardamom and saffron, I bet the flavor is incredible, as well as the health benefits! I have pinned and yummed the recipe so I don’t lose it. Definitely going to try this! What an interesting drink this is. I have heard much about the health benefits of almond m ilk and would love to try this. Thank you for sharing with us at sweet Inspiration. I am pinning and sharing. This sounds so rich and nourishing! Thanks for sharing at the Healthy Living Link Party! I tried this yesterday . Loved this and I give this a 5 star . Sugar needs to be adjusted based on personal preferences . ( so don’t add a lot in the beginning) Just finished entering it in my recipe book with asiya’s name and this website as the source next to it. Thank you jazakillah khair asiya! Healthy and tasty. Will definitely try it for my kid today. Lovely presentation.